The average residential listing price was $304,044, an increase of 10.3% from September 2016. Average sales prices also rose by 10.7% to an average of $299,788, compared to $270,875 a year ago. Average residential sales prices for the last quarter have been higher on average than sales prices for July through September of 2016. The number of new listings coming on the market is down 6.7% from last year, with 358 residential units listed in September 2017, compared to 384 last September. The number of new residential listings on the market began to drop in July for this quarter and continued through September. This steady decrease in available listings is on par with data trends from 2016. 3,905 homes sold-8% fewer residential sales than at this point in 2016. The National Association of REALTORS® released their 2017 Remodeling Impact Report. The report takes a deep dive into the reasons for remodeling, the success of taking on projects, and the increased happiness found in the home once a project is completed. 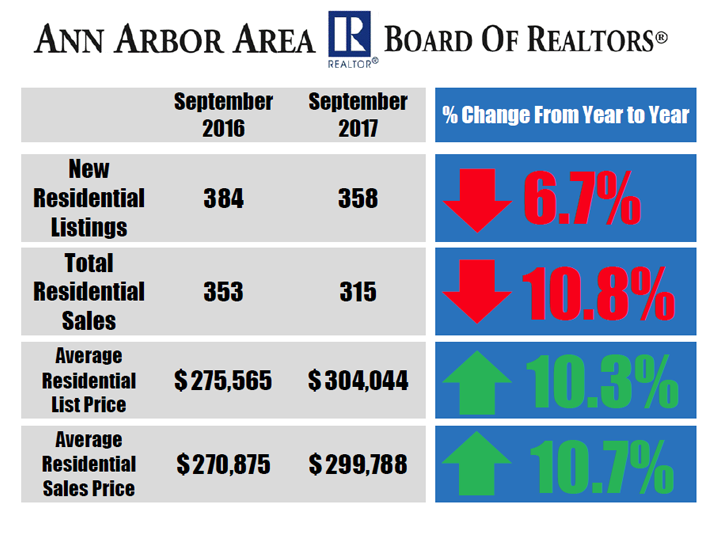 To see more Ann Arbor Area housing statistics, view the September 2017 Housing Statistics Report.